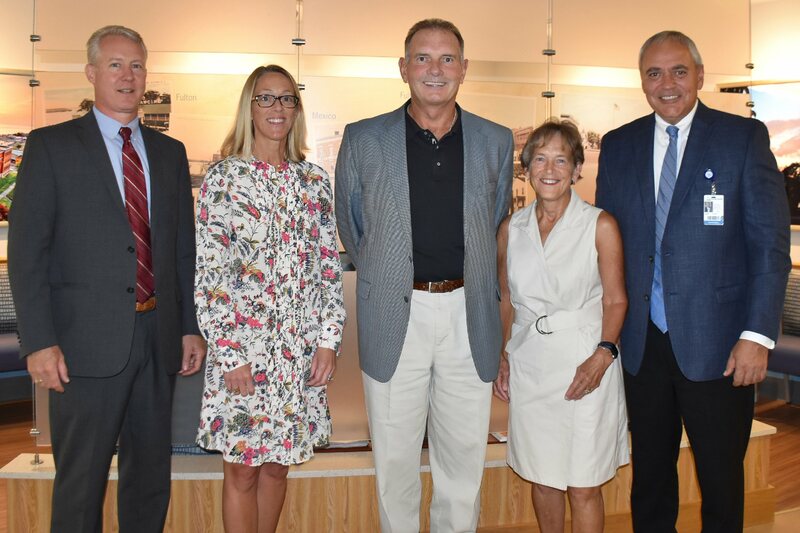 From left are: Oswego Health EVP and COO for Oswego Hospital Jeff Coakley, Oswego Health Major Gifts Officer Margaret Barclay, John and Barbara Sharkey, and Oswego Health President and CEO Michael Harlovic. OSWEGO – A local couple has made a generous donation to Oswego Health, signifying their support of excellent local healthcare services. 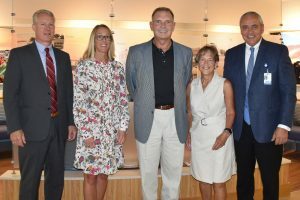 Barbara and John Sharkey III made a $25,000 donation to Oswego Health after touring Oswego Hospital and seeing firsthand the modern facilities and high-quality services available locally. Their tour included seeing a prototype of a new private patient room that Oswego Hospital will begin building later this year. In the upcoming months, as part of a $7.6 million investment in local healthcare, the hospital’s two medical/surgical floors will be transformed to offer 36 private rooms that feature their own bathroom and a hotel-like feel. The renovated floors will offer several other patient and family comforts. One other major project that the health system will soon begin is the transformation of its Behavior Health Services facilities. Oswego Health will completely renovate the former Oswego Price Chopper store into a model BHS facility. Community members wishing to support these projects should call Oswego Health Major Gifts Officer Margaret Barclay at 315-326-3519.